The Fukushima nuclear accident has created an alternative space for science knowledge production practices. Since the beginning of the accident, a wide variety of people, including but not limited to lay people, have engaged in DIY (do-it-yourself) reporting of Geiger counter readings for their health and safety, and have distributed the resulting data to those who are concerned about nuclear radiation by harnessing the Internet. As early as March 13 2011, Geiger counter readings were broadcast via UStream (Nihon Saiken Initiative, 2012). On March 17, Dr. Ryo Ichimiya, a researcher at the High Energy Accelerator Research Organization, created a website called “Radio Monitor 311,” which summarizes radiation monitoring data and graphs related to the Fukushima nuclear accident (Nihon Saiken Initiative, 2012). This study examines how different groups of people became engaged in scientific knowledge production practices following the accident. Considerable effort has been invested in studying the role of public engagement in man-made environmental disasters (Blocker & Eckberg, 1989; Bullard & Wright, 1993; Brown, 1987; Brown 1992; Brown 1995a; Brown 1995b; Brown 1997; Brown & Ferguson, 1995; Callon et al, 2009; Edelstein, 1988; Erikson, 1976; Kaplan, 1997; Latour, 2004; Levine, 1982; Petryna, 2002; Picou, 1990; Wynne 1992). Given the scholarship on the role of the public in generating scientific knowledge following man-made disasters, focusing on the Fukushima nuclear accident provides one major finding: The Fukushima nuclear crisis gives us insight into how different groups of people generated nuclear risk knowledge by harnessing the Internet and social media following the accident. While many different kinds of people got involved in generating nuclear risk knowledge following the Chernobyl accident (Kuchinskaya, 2007; Petryna, 2002), it should be underscored that the Fukushima nuclear disaster is the first major nuclear disaster since the advent of the Internet and social media. The questions then are: do the Internet and social media provide people with tremendous opportunities to produce nuclear risk knowledge following the Fukushima nuclear accident? Given the changing nature of media ecology, how do people generate nuclear risk knowledge by harnessing the Internet and social media in Japan and beyond? How was nuclear risk cultivated by people using the Internet and social media following the Fukushima nuclear accident? Are there any cultural and social contexts that shaped the ways in which people generate nuclear risk knowledge by using the Internet and social media? This study will make potential theoretical contributions to previous studies on the role of the public in generating scientific knowledge after man-made disasters. There is great diversity with respect to the agencies, motivations, focus areas, goals, and strategies employed by a number of individuals and organizations, all of which could be placed under a lager banner as collectively engaged in “post-Fukushima DIY networks.” Despite the vast landscape of post-Fukushima DIY networks, this study will focus on examining one specific case: Safecast. Safecast was chosen for this study in two reasons. First, Safecast, like many other post-Fukushima DIY networks, tactically harnesses the Internet and social media in order to generate nuclear risk knowledge. Second, Safecast plays a leading role in generating nuclear risk knowledge in Japan and beyond. While it is difficult to generalize the findings of this research on Safecast, this study helps illustrate the nature of post-Fukushima DIY networks. In doing so, this study aims to contribute to the development of media/communication studies as well as science, technology and society (STS) studies as well. This study is based on discourse analysis of Safecast’s website and my fieldwork in Japan. The first section of this paper describes the sociotechnical context in which Safecast has engaged in science knowledge production practices. The second section will continue by discussing a key conceptual framework for this study: Collective intelligence. Once the theoretical framework is laid out, the third section will illustrate the ways in which Safecast has generated nuclear risk knowledge. The final section summarizes the finding of this research and indicates directions to the future research. Japan has witnessed the surge of nuclear risk knowledge production practices following the Fukushima nuclear accident. Heterogeneous groups of people such as government officials, local legislators, journalists, activists, and academics have measured the level of and talked about nuclear radiation in terms of health safety, contributing to the surge of nuclear risk knowledge production. For instance, Japan’s Ministry of Education, Culture, Sports, Science and Technology (MEXT) produced nuclear risk knowledge by mapping nuclear radiation (Nihon Saiken Initiative, 2012). On the other hand, Japanese scientists generated radically different nuclear risk knowledge in terms of health safety. For example, Dr. Shunichi Yamashita, Professor of Nagasaki University, stated in Fukushima that nuclear radiation would not affect people who are smiling, and emphasized the urgent need to relieve radiation anxieties (Spiegel, 2011). On the other hand, Dr. Hiroaki Koide, Assistant Professor of Kyoto University, urged the Japanese government to evacuate people from the whole prefecture of Fukushima in terms of their health safety (Koide, 2011). The contradicted nuclear risk knowledge was widely circulated via social media. Given the growth of contradicted nuclear risk knowledge production practices, many people have utilized Geiger counters as a technology to make invisible nuclear risk visible and, more specifically, quantifiable in order to generate nuclear risk knowledge for their health safety. It should be noted that Japanese mass media may have partially helped post-Fukushima DIY networks emerge. On May 15 2011, for example, Nihon Hōsō Kyōkai (NHK) broadcast a documentary that featured the ways in which Japanese scientists mapped nuclear radiation contamination. Japan’s media ecology may have similarly paved the ways for concerned citizens to get involved in post-Fukushima DIY networks. In order to understand post-Fukushima DIY networks, it would be useful to contextualize them in sociotechnical systems. Paul N. Edwards (2010) argues that the concept of infrastructure (Edwards, 2003) applies to knowledge because it sees knowledge as “an enduring, widely shared sociotechnical system” (p.17). Hence, Edwards proposes the notion of knowledge infrastructures, which “comprise robust networks of people, artifacts, and institutions that generate, share, and maintain specific knowledge about the human and natural worlds” (p.17). Drawing on Edwards’s concept, this paper attempts to examine Safecast as one element of what can be called “nuclear risk knowledge production systems.” They comprise Geiger counters, the Internet, social media, scientists, engineers, public health officials, local governments, Safecast, and other DIY networks among others. While Geiger counters make it possible to produce narratives of nuclear risk as numbers, measurement data per se cannot be a useful resource for nuclear risk knowledge production. The sociotechnical elements—volunteer Geiger counter users and social media users among others— are necessary to produce specific type of nuclear risk knowledge. Given this contextualization, the next section discusses a key conceptual framework to analyze Safecast: Collective intelligence. The concept of collective intelligence, coined by French Philosopher Pierre Levy is one of the key concepts in the increasingly networked contemporary society. Levy (1997) characterizes collective intelligence as “a form of universally distributed intelligence, constantly enhanced, coordinated in real time, and resulting in the effective mobilization of skills” (p.13) and notes that “the basis and goal of collective intelligence is the mutual recognition and enrichment of individuals rather than the cult of fetishized or hypostatized communities” (p.13). The collective intelligence suggests that under certain conditions, people and computers could be connected to work together such that they act more intelligently than any person, group, and computer (Malone, 2013). As illustrated in the next section, heterogeneous groups of people worked together via Safecast to generate nuclear risk knowledge in Japan and beyond. Indeed, one of the key members at Safecast explicitly stated in my interview that the fundamental philosophy of Safecast can be seen in The power of pull: How small moves, smartly made, can set big things in motion (Personal Communication, 2012). Thus, the conceptual framework of collective intelligence is likely to help understand how Safecast has engaged in science knowledge production practices following the nuclear accident. In order to generate better nuclear risk knowledge, Safecast indicates it is necessary to aggregate more data from multiple sources. Indeed, James Surowiecki (2004) argues that diversity of opinion, independence, decentralization, and aggregation are key conditions to make collective judgment most effective. By extension, as long as radiation measurement data are created equal via Geiger counters and the massive volume of data is aggregated from multiple sources independently, the collected data are likely to be accurate. At the time of this writing, Safecast has aggregated and published around seven million measurement data points in Japan and beyond. In so doing, Safecast generates nuclear risk knowledge in China, South Korea, Macao, Australia, Ireland, Austria, and the United States among others (Safecast, 2012). Given the tremendous volume of measurement data, Safecast plays a significant role in generating nuclear radiation knowledge following the Fukushima nuclear accident around the globe. As a part of the Momoko Ito Foundation, a nonprofit organization which was established to foster the US-Japan relations thorough new information technology, Safecast received a grant from the John S. and James L. Knight Foundation. One of the active members noted in my interview that a member of the foundation had considerable experience in writing a grant application, which helped Safecast receive the grant (Personal Communication, 2012). Moreover, Safecast, whose office is located in Shibuya, Tokyo, collaborates with other institutions such as Scanning Earth Project at Keio University, International Medcom, Uncorked Studios, and Global Survey Corp, among others. One of my interviewees summarized the essence of Safecast’s organizational culture as “Otaku/Western culture” (Personal Communication, 2012). In Safecast, according to the interviewee’s accounts, people are extremely enthusiastic about developing the way in which they collect measurement data without any interest in seeking hegemony within the network (“Otaku culture”).On the other hand, trial and error are highly encouraged in Safecast’s culture when compared to Japanese organizations (“Western culture”). Particularly noteworthy is the role of social media in attracting serendipitous encounters between concerned people and Safecast. In my interview, for example, one of the active members noted that while reading his Twitter home timeline in the immediate aftermath of the disaster, he happened to find a Twitter user who needed his technical knowledge and skills. My interviewee immediately contacted the user via Twitter and, ultimately, started to get involved in the DIY network (Personal Communication, 2012). While “offline” networks undoubtedly matter for the agile development of Safecast, it should be noted that social media also play a role in enhancing collective intelligence. In addition, Safecast harnesses the Internet and social media to generate specific nuclear risk-related knowledge for both English and Japanese readers, whereas some information is available in English only. On its website, for example, Safecast discusses news related to nuclear risk and generates nuclear risk knowledge in the following way. Since the beginning of the accident, many sources have been quoted that the psychological impact is likely to be the most significant. Sadly, certain parties with a vested interest see this as inferior to physical impacts. To some observers, only the fatality count matters. I do believe it is inappropriate and possibly even unethical to measure disasters by comparing the number of casualties. I agree that, at least for now, the mental consequences for residents are likely to more significant than the physical ones (Rösler, 2012). According to this account, physical impacts as one category can be clearly distinguished from mental impacts, and suggests the primacy of psychological impacts over physical impacts. While this account is from the “personal observations” of the author and this statement does not represent Safecast, this discourse on nuclear risk may be seen as a part of Safecast’s moral and epistemological claims and contribute to the generation of nuclear risk knowledge. Moreover, Safecast harnesses Facebook and Twitter to report its daily activities such as Geiger counter building for those who are interested, and distributes measurement data to concerned citizens. Thus, Safecast harnesses the Internet and social media to get engaged in nuclear risk knowledge production practices. With such extraordinarily high volume of data on nuclear radiation, it is important to examine Safecast’s view of measurement data in order to understand how Safecast has engaged in nuclear risk knowledge production practices. Safecast is not anti nuclear, or pro nuclear – we are pro data. Data is apolitical. Safecast was created because we identified a lack of data and realized we could help fill that gap. Our goal is simply to provide more information, data where it didn’t exist so that people can make more informed decisions based on fact rather than the fear and speculation that comes from uninformed rumor (Safecast, 2013). As such, Safecast views itself as a pro-data organization, indicating that data speak for themselves because “data is apolitical.” While Safecast allows people to download raw radiation measurements for free, it should be underscored that Safecast also manipulates and re-presents them. As Safecast admits, it does not simply “provide” unprocessed measurement information and data. For example, Safecast visualizes measurement data on Safecast Map. On the map, measurement data are processed and categorized in six colored layers, and people can become informed of the level of nuclear radiation by seeing the visualized and colored data on the user-friendly map alone. Since these visualized data are processed and categorized by Safecast, they are different from nuclear risk knowledge that individual volunteer Geiger counter users have produced at their specific measurement spots. While making raw measurement open to the public, Safecast also re-presents individual measurement data on Safecast Map and, technically speaking, constructs a different kind of nuclear risk knowledge on the map via the Internet. As a pro-data organization, Safecast generates nuclear risk knowledge by harnessing measurement data in multiple ways. Whereas Safecast initially claimed not to “work with any government and government agency directly” precisely because they try to “remain independent and uninfluenced by politics of any kind,” Safecast announced on September 15, 2012 that Safecast’s radiation measurements were partially adopted by Fukushima Prefecture to create the world radiation map (Safecast, 2012). In my interview, one of the active members stated that Safecast does not work with the Japanese national government due to a lack of the transparency of the information provided by them (Personal Communication, 2012). While both Safecast Map and Fukushima’s world radiation use the same data, their ways of data representation are radically different. For instance, Fukushima’s world radiation map indicates there has been only one datum seen in Seoul, whereas Safecast Map represents more nuanced data there. In doing so, Safecast contributed to generating nuclear risk knowledge in different ways. Finally, Safecast provides an Application Programming Interface (API), allowing people to access raw measurement data. More importantly, Safecast presents useful information on measurement data such as geo-location information and time of upload. Such information not only makes it possible to locate when and where each datum was captured and uploaded, but also allows people to process the huge volume of raw measurement data for their own ends. Put differently, Safecast makes it possible for people to generate nuclear risk knowledge for their own sake by using the open raw measurement data. Here is an example. By using Perl, I examined how Safecast generated measurement data in the town of Okuma, where the Fukushima Daiichi nuclear plant was located. Data collection was conducted on November 24, 2012. Measurement data collected in Okuma were retrieved by using the geo-location service provided by the National Land Information Division of National and Regional Policy Bureau of Japan. Overall, the geo-location service provided 2,125 data points within the latitude and longitude of Okuma, showing that the whole area of the town is located from 37.37377 to 37.43163 degrees north latitude and from 140.9389 to 141.0346 degrees east longitude. Based on the information provided by the geo-location service, the number of Safecast’s monthly radiation measurements was counted. 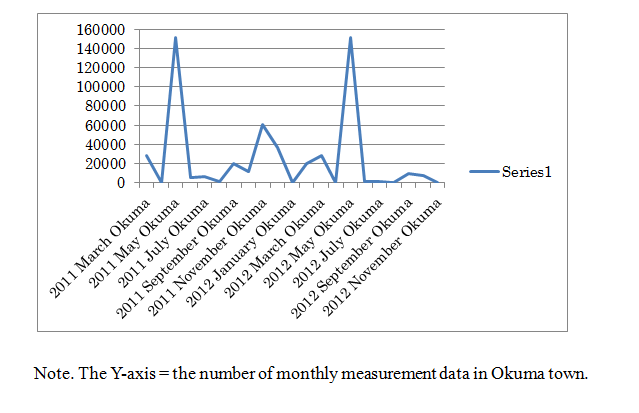 Figure 1 shows the number of monthly measurements in Okuma from March 2011 to November 2012. Thus, Safecast allows people to generate knowledge related to nuclear risk for themselves. This figure shows that while 538,439 radiation measurement data points were collected in Okuma from March 11 2011 to November 24 2012, no radiation data were recorded in several months. This figure indicates the ways in which Safecast actually generated nuclear risk knowledge in Okuma, and shows that Safecast allowed people to produce a new type of knowledge regarding nuclear risk. This paper illustrates how different groups of people have engaged in nuclear risk knowledge production practices following the Fukushima nuclear accident by examining Safecast in the context of nuclear risk knowledge production systems. Three key findings emerged. First, Safecast played a significant role in generating nuclear risk knowledge following the Fukushima nuclear accident by harnessing the power of collective intelligence. Given the huge volume of radiation measurement data, Safecast cannot be ignored in nuclear risk knowledge production systems following the disaster. Second, whereas Safecast does not provide any comments on its measurement data, their data process and data representation could generate multiple types of nuclear risk knowledge. Third, Safecast allows people to generate nuclear risk knowledge by providing raw measurement data. This study examines Safecast alone. In order to capture the role of Safecast in shaping nuclear risk knowledge systems, it is necessary to analyze other post-Fukushima DIY networks including Hakatte Geiger among others in relation to the role of Safecast. Moreover, this study worked with rather abstract descriptions of the development of Safecast. In the future, more engaged ethnography would be necessary to better understand the DIY network. In doing so, the concept of nuclear knowledge production systems should be also elaborated further. However, the findings of this study indicate the role of Safecast in shaping the Fukushima nuclear crisis in the context of sociotechnical systems. —. (2011). The Penguin and the Leviathan: How cooperation triumphs over self-interest. New York, NY: Crown Business. Blocker, T.J. & Eckberg, D. (1989). Environmental issues as women’s issues: General concerns and local hazards. Social Science Quarterly, 70, 586-593. Bloom, H. (2002). Global brain: The evolution of mass mind from the big bang to the 21st century. Danvers, MA: Wiley & Sons. —. (1997). Popular epidemiology revisited. Current Sociology, 45, 137-156. —. (2003). Qualitative methods in environmental health research. Environmental Health Perspectives, 111(14), 1789-1798. Brown, P., & Ferguson, F. (1995). “Making a big stink”: Women’s work, women’s relationships, and toxic waste activism. Gender & Society 9, 145-72. —. (2010). A vast machine: Computer models, climate data, and the politics of global warming. Cambridge, MA: MIT Press. Erikson, K. (1978). Everything in its path: Destruction of community in the Buffalo creek flood. New York: Simon and Schuster. —. (2006b). Fans, bloggers, and gamers: Exploring participatory culture. New York NY: New York University Press. —. (2010). Articulating the signs of danger: Lay experiences of post-Chernobyl radiation risks and effects. Public Understanding of Science, 20(3), 405-421. Levy, P. (1997). Collective intelligence: Mankind’s emerging world in cyberspace. Cambridge, MA: Perseus books. Nihon Saiken Initiative. (2012). Fukushima genpatsu jiko dokuritsu kenshō iinnkai: Chosa/kenshō hōkokusho [Independent investigation commission on Fukushima Daiichi nuclear accident: Investigation report]. Tokyo, Japan: Discover 21. Reich, M. (1991). Toxic politics: Responding to chemical disasters. Ithaca, NY: Cornell University Press. Weinberger, D. (2012). Too big to know: Rethinking knowledge now that the facts aren’t the facts, experts are everywhere, and the smartest person in the room is the room. New York, NY: Basic books. —. (2005). Risk as globalizing ‘democratic’ discourse? Framing subjects and citizens. In M. Leach, I. Scoones & B. Wynne (Eds. ), Science and citizens: Rights, participation and accountability (pp.66-82). London, UK: Zed Books. Yasuhito Abe is a PhD student at the Annenberg School for Communication and Journalism at the University of Southern California. His research interests center on public engagement in science knowledge production practices following the Fukushima nuclear accident, and has also published several articles related to the Fukushima/East Japan Disaster, including “Pray for Japan: Reinventing ‘Japanese national character’ after the Tohoku earthquake, tsunami, and nuclear crisis” (World Dignity University Press, 2013 forthcoming). This is an interesting piece on the role of radiation measurements after Fukushima. You describe Safecast as DIY, which suggests an autonomous ethos to the data collection. Though I’m not sure if safecast uses this language in Japanese, there are several testing centers in Japan that call themselves “citizen testing centers (shimin).” This language i think can be seen as more political, for it sets them apart from government measurements from the get-go. You made the argument that safecast has a political side in terms of its re-presentation of data, and I was wondering if anything came up in your interviews on the relationship between a DIY/Hacker identity, and the politics of collecting radiation data. I liked this piece, but wanted to push the author to engage the broad literature on “citizen science” which emerged in the past decade or so. One example were the community science centers established across New Orleans following Hurricane Katrina where local residents could test lead levels in their own blood, in their environment, and in their air (as they distrusted the official reports issued by organizations such as Tulane University, the Mayor’s Office, and so on). I’d like to hear how SafeCast’s practices meet with or diverge from past attempts at putting the collection and analysis of data in the hands of residents. Safecast–with its rapid launch, millions of uploaded data points, and cross-border reach–seems like an excellent choice to examine nuclear risk knowledge production using the concept of collective intelligence. Levy describes collective intelligence as universally distributed knowledge, but Ryuma Shineha’s paper for this forum suggests that knowledge about 3.11 has been quite unequally distributed via the internet, due to access issues and wealth inequality between Tohoku and other regions. Would you agree? In the background section it would be interesting to situate DIY in Japan culturally as well as sociotechnically. For example, many people globally associate DIY with North America and would never know about the ways that DIY is institutionalized in Japan, not only via tech-oriented groups, but also through retailing of DIY materials at big stores like Tokyu Hands, etc. Thanks for sharing this work Yasuhito. Clearly, the Safecast claim that data is apolitical is patently false, and yet also revelatory–it reveals the fears of the DIY Safecast enthusiasts, fears that official organizations are lying to them by obscuring, manipulating, and hiding data. What keeps it from veering into the realm of the conspiracy theory? Could it evolve a profit model (like Facebook)? Data storage isn’t free, will Safecast become a competitor for foundation grants? It also reveals a positive vision as well, a vision of a connected world, where data transcends political, language, national, and expert/non-expert boundaries. There is a utopian feel to it almost. I will be fascinated to see what others think at the meeting–as you point out 3.11 is the first major case of a disaster in the fully crowd-sourced, socially-mediated age. I particularly enjoyed reading both yours and Luis’s articles on Safecast and am looking forward to hearing more about this group. I was particularly struck by Safecast’s motto as being pro data, arguing that “data is apoltical,” which is an ongoing trope of the Internet (as Scott Knowles points out above) and somehow manages to stick around. In some ways, Safecast’s activities reminded me of Google, but on a smaller scale (providing free APIs, facilitating data access, while also manipulating the information without full disclaimer). I am also glad you are working through distinguishing information/data providing from knowledge production, which your example on Okuma highlights. Yasuhito, thank you for that concise and clearly articulated glimpse at Safecast and some of the issues it raises. As Laura said, it is especially interesting to read your paper in conjunction with Luis’s. You rightly point out that interpretation and representation of data involve subjective judgment, and thus are not divorced from questions of standpoint or politics. In his paper, Nicolas delves into the the politics of data interpretation and questions of trust, and in that respect his paper complements yours. Also, his earlier work published in the first Fukushima Forum virtual conference (2012 edition) interrogates the notion that even “simple” data generation is free of uncertainty and thus judgment and interpretation. Of course, all of these ideas go right back to core STS critiques of claims to objectivity, technical rationality, and expert knowledge. I see that section of your paper (as well as Nicolas’s) as contributing to that storied tradition. In Laura’s response to Luis’s paper, she asked of the Safecast volunteers, “isn’t it also important to think through their own techno-elitism positioned against their non-technoscientific consumers of their information?” I think she is suggesting that they exhibit an elitism which is rooted in certain notions about the primacy of technical know-how and the roles of technology and quantitative data in society. Indeed, I wonder if their self-identified position as “hackers” is bound up with assumptions about the putatively objective nature of “raw data.” In fact, I think both yours and Luis’s paper suggest this very thing, but I wonder if you can comment upon this further. I agree with Daniel that you would benefit from engaging with the burgeoning literature on citizen science. Before I pivoted to participatory recovery planning, I spent much of my time in grad school studying it. (I can send you my 2nd year research project paper if you’re interested.) There are strong resonances between Safecast and a number of citizen science endeavors. It would be interesting to see how that literature might productively inform your study of Safecast. As for “collective intelligence” as a concept or framework, I am not sure if it is particularly productive without going into considerably more depth than you have space for in this brief paper. I think that both what “collective” means as well as what “intelligence” means need to be strictly defined in order to be useful, and the body of literature you cite represents many different ways of defining these terms, which reflects its conceptual flexibility and breadth. For some, “intelligence” is about problem solving, for others decision-making, and for others accumulation of data and knowledge. The “collective” aspect can be additive, or can represent network effects that supposedly produce results greater than the sum of their constituents, or it can be more about geographical distribution, or temporal parallelism, etc. In short, when invoking such a concept, I think you need to be very specific about how you define and use it. The good news is that the need to do this actually represents an opportunity for you to articulate your own specific argument and thus to underscore your own, unique contributions. More importantly than this minor critique, however, I think that your invocation of “collective intelligence,” like Luis’s invocation of “distributed expertise,” represents the crucial recognition of a fundamental question about Safecast and endeavors like it, which is to what degree (if at all) it represents a new way of producing, organizing, and distributing knowledge or articulating a certain kind of political power. This is very interesting research on important work being done by concerned citizens to supplement (if not compensate) for the work being done by the Japanese government and international nuclear regulatory organizations such as the IAEA. It would be interesting to compare the standards of evaluation being invoked by these citizen groups to assess whether or not the information being gathered is scientifically grounded and accurate, and thus can even be meaningfully compared to data acquired by government and so-called expert authorities in medical and scientific organizations. Safecast is unusual in that some of their staff had a background in radiation assessment well before the Fukushima accident happened, and are technically proficient. But most of the citizens who they have enlisted in the cause, as sincere as they are, have been on a very steep learning curve in a complex field that may require more than good intentions to produce data that could stand the scrutiny of peer-review and be useful for objective scientific assessment. Safecast is admirable in their stance to provide value-free data that is not politically biased, but surely that is more rhetoric than reality (as Scott Knowles notes): they would not be doing this if they thought the government sources were comprehensive and accurate; or if so, if that data was being readily shared to a worried public. Their work is at least an implicit critique (their institutional persona as it is publicly represented notwithstanding), and outside the Safecast’s institutional representatives, many of their allies are doing this out of fear, frustration, resentment and anxiety – not a good recipe for objective analysis. This is important because for their work to have more than a political impact, there has to be a common base of criteria invoked so that databases can match up and be integrated – or at least meaningfully compared. It is encouraging that, as you note, Safecast has been able to link up with the Fukushima government authorities, despite having radically different standards. In time, it will be interesting to see just how that goes – if the data is used, how the data is used and for what ends. It is also encouraging that Safecast has consulted with non-governmental authorities who are doing work that is scientifically rigorous like Ryu Hayano at Todai and Masaharu Tsubokura, a medical doctor at Soma Central Hospital in Fukushima, who is also associated with U. of Tokyo. These authorities may build a bridge between marginalized NGO groups and government authorities and lend legitimacy to the cause. These NGO citizen activist groups are a welcome exception to Japan’s moribund Civil Society, and may represent a new moment in political activism in Japan. As such, groups like Safecast may be the leading edge of citizen activism in Japan and are a fascinating subject for study, that has broad implications for Japanese politics. A great area for study. I really look forward to hearing more about your work and seeing how it develops. I’ll be interested to hear responses to the preceding comments. A small matter, perhaps connected to the issue of trying to appear apolitical: The use of OTAKU here as non-hegemonic strikes me as unusual. That might be an implication of other potentially applicable translations (“geek” or “x-aholoic” [manga-holic]”) but it doesn’t seem central to common usage. I’m curious how you came to adopt this translation. I enjoyed this paper. And I think this theme can be discussed in the context of the relationship between Science communication and Collective intelligence. The norms and participants of science communication in the emergent time is one of the key issues, and this paper seems to supply some implications to think the matter, at least following points: network collaboration worldwide, free and open data source for the public, and distance from the politics. Off course, it seems to be difficult to think that this trial achieve perfect non-political way, but the norms of data-oriented and information disclosure will give lessons to discussions on science communication activities. Ditto others’ comments: this was an informative and interesting paper. I also would look forward to more context, not only in terms of how data is collected, but also how it is used and (equally interesting, from my point of view) how it is contested. I also look forward to seeing the paper do more with the idea that data is political (despite Safecast’s claims to the contrary). If it is political, how so? Articulating some specifics here would be most helpful. Dear Abe, I subscribe to the other comments regarding your contribution. IMHO, your work contributes a lot in respect to the entaglements of the online and offline, the usage of new media for collective mobilization and their role in the context of the crisis. I have a few questions I would like to ask regarding your research findings. In respect to the ‘Otaku’ identity and the contrast between Japanese cultures and Western cultures, I was wondering if you have found more that you could talk about? In my own fieldwork experience, this is a very important and recurrent point of discussion, given that most of the core participants of Safecast are Gaijin (some of them, established in Japan for a long time, having family ties and raising their kids in Japan). I have in one of my interviews a Japanese volunteer of Safecast calling some of the core technical volunteers “good Otaku who are working for the collective benefit”. Another question: have you considered using the concept of “technopolitics” coined by Pierre Levy in your analysis of politics of data representation? In addition to the notion of “Collective Intelligence”, it points to a constitutive struggle involving different discourses and agents in shaping particular technologies (its “coming into being” – from a virtual, latent struggle into actuality). It could be a very useful concept to discuss alongside with that of “Collective Intelligence”, which tends to privilege the collective product of a partial and circumstatial assemblage instead of taking into account the very material and political steps towards achieving a collective result in the first place (either on or offline). And yet another quick question: your discussion of “nuclear risk knowledge” is very fruitful, but I wonder if in accounting for it you are not jumping too fast from information, to data, and to knowledge without accounting for the difference. To put this in another way: by clarifying each step in the actual work of data gathering, filtering, visualization, and interpretation by experts and affected communities, you might be able to highlight useful distinctions between data and knowledge. Looking forward to our discussions and collaborations at the workshop! Thanks for this provocative paper, Yasuhito. There are some excellent comments as well, so you’ve gotten an important conversation underway. Of the many aspects of this topic that interest me, I’ll mention the question of authority: scientific, rhetorical, and political. As some of the commenters noted, there are questions about how Safecast demonstrates rigor, validity, reliability, and the other markers of authoritative science. Basic questions of how to calibrate a Geiger counter, how to take mesurements reliably, how to record, report, and interpret the measurements, and what the results imply arise immediately. By asking Safecast to do all of that that, we risk reifying the technocratic elitist model–“only credentialed scientists can do real science.” But at the same time, Safecast’s rhetorical authority rests upon its scientific authority, and the standards for that scientific authority need to be made clear. Safecast must either aspire to the standard model of radiological research, or else articulate a different model that still qualifies as “science.” What would that model be, and who makes that judgment? There’s a kind of reflexive loop at play here. Another question that interests me involves the claim that more data is (are?) better. We know that data is (are?) not the same as knowledge. This is one subset of a larger set of questions involving “technological enthusiasm,” to use Hughes’ term, or unreflexive confidence in the power of new technologies to solve problems triggered by older technologies (cf. Beck), transplanted from older technological domains (with nuclear technologies as an example) to the domain of new information and communication technologies. Thanks for this paper! Just a little add-one to the already posted comments regarding the political. The recent success of the ‘Piraten Partei’ in Germany shows the degree to which questions related to ‘data’ and ‘internet’ have gained weight in party politics. In this regard, I would be interested to hear more about the ways in which the political role of Safecast is perceived in Japan and internationally. In addition, I would very much like to learn more about the ways their activities are received in pro- and anti-nuclear circles, again especially in relation to Safecast’s self-proclaimed ‘apolitical’ stance. I’m very happy to see this evolution of your paper, and the analytic framing that you have given it. I suppose everyone’s helpful suggestions above might compel you to take it even further in this regard! I also echo the suggestions people have made both for this paper and Luis Felipe’s; I too am interested in how the data has in fact played within political/policy/medical circles in spite of (or as consistent with) the group’s assertions about policy neutrality. Also, in interpreting this paper in light of Cabasse’s, how does Safecast’s rendering of its maps constitute risk? What does it necessarily make visible and invisible in the manner discussed by the authors she cites (notably November). This might be one entry into the question of the embedded politics of Safecast (and representations in general). Also, with respect to your choice of discourse analysis as your main method of analysis, what are the strengths and limitations of this method? What does it help to reveal, and what does it make more difficult to unpack? I think your paper actually utilizes mixed-mode analysis, but I thought it worthwhile to raise this question, especially given the opportunity to draw a methodological comparison here with Luis Felipe’s analysis. Really interesting paper, and likely a very useful workable concept of creating a “global commons” for sharing scientific information about radiation measurements. It demonstrates the potential contribution that current technologies can make to studying these complex events. This paper tried to describe the knowledge-production process which non-expert were participated in and using social network effectively. And I think there are some keypoints for thinking this case. First is the possibility of connecting to discussions on public engagement and discussions on open source/software. And second is the meaning of action “measurement” (はかる). And the meaning of the way of “measurement” in the case of Safecast. And in my opinion, this point is important, because “measurement” (はかる) enable and mediate the non-expert to participate in knowledge-production process, and I think it’s common point of various activities for radiation measurement. Probably, action “measurement” have some meanings of performance and bring embodiment of participation. If it correct, it may be interesting to compare Safecast and other cases and examples which are mediated by some action or performances such as “measurement” (はかる). What is different? And is there any differences of meaning of measurement? And I think this theme can be discussed in the context of the relationship between Science communication, public engagement, and Collective intelligence. The norms experts participated in science and risk communication in the emergent time is one of the key issues at the Japanese context, and this paper seems to supply some implications to think this matter, at least following points: network collaboration worldwide, free and open data source for the public, and distance from the politics. Off course, it is difficult to think that this trial achieve perfect non-political way, but the norms of data-oriented and information disclosure will give lessons to discussions on science communication activities.